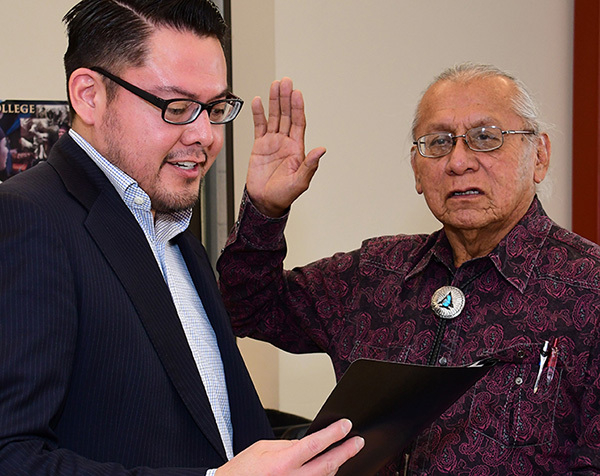 TSAILE, Ariz. — Diné College’s newest board member was recently sworn in — marking Daniel Tso’s second stint serving the college’s Board of Regents. A New Mexico State University graduate who possesses a bachelor’s of science degree in agriculture and animal science, Tso said Diné College has definitely fulfilled the mission it set out to do when the institution was created in 1968. Originally from Nenanezad, N.M., — located in the northwestern section of the Navajo Nation Indian Reservation — Tso previously served the BOR during the 1990s. He now replaces Nelson BeGaye. He is the Navajo Nation Department of Health and Human Services appointee. Tso is also a member of the Navajo Nation Council, where he represents the communities of Littlewater, Whitehorse Lake, Baca/Brewitt, Casamero Lake, Ojo Encino and Counselor. He was previously a council delegate from 1986 to 1995. In an interview, Tso said he’s looking forward to tackling the various issues that come before Diné College board members. He lauded the college’s Shiprock campus, noting its new buildings, particularly the state-of-the-art John Pinto Library. He praised Sen. Pinto, D-Tohatchi, for advancing educational and funding projects in the New Mexico Legislature that pertain to Diné College. Tso’s work experience includes processing facilities, interim wheat crop and alfalfa crop manager positions with the Navajo Agricultural Products Industry. Additionally, he is a staunch community leader, advocating for anti-fracking campaigns throughout New Mexico, particularly the Greater Chaco region of northwest New Mexico. He is an accomplished map-maker and speaker on extraction issues, who has documented the encroachment of the oil and gas industry on federal, public and tribal lands in the state. Greg Bigman, president of the college’s BOR, welcomed Tso to the board and administered the oath of office. Diné College is a four-year tribal institution. It is the first tribally-controlled institution of higher learning in the U.S. Besides Tsaile, the college operates campuses in Tuba City, Chinle, Window Rock, Crownpoint and Shiprock.